Pharm-Binz is designed to help farming businesses to dispose of empty vaccine, antibiotic and wormer packaging. 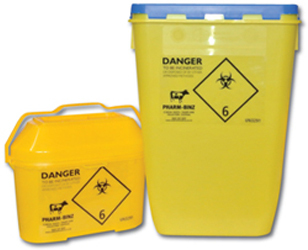 We also supply containers to dispose of sharps easily and efficiently. It supports your agricultural business in its farm assurance compliance, by offering a cost-effective solution for farm clinical waste transfer. 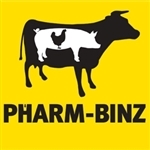 Founded in 2008, the Pharm-Binz service is unique, well-established and already supporting significant numbers of livestock farmers throughout the UK. The bin, delivery, collection, incineration and provision of a waste transfer note to comply with the farm assurance (N.S.F, Red Tractor or Freedom Foods) requirements, are all included in set fees. A single phone call is all it takes to arrange collection of full bins and arrange delivery of replacement units. Pharm-Binz service is available to all agricultural businesses, regardless of the size of farm.